MiniMoni. Shakatto Tambourine! Dapyon! (ミニモニ。シャカっとタンバリン！だぴょん！) is a Sony PlayStation video game released exclusively in Japan in 2002. 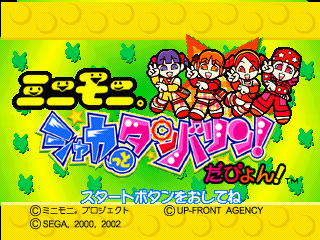 It stands as the only original PlayStation game to be created by Sega (though the company also published a rereleased version of Puyo Puyo Sun for the platform). MiniMoni. Shakatto Tambourine! Dapyon! is a console adaption of the Sega NAOMI arcade game, Shakatto Tambourine!, the major difference being a licensing deal with Japanese pop group MiniMoni. Shakatto Tambourine!, a game similar in nature to the popular Samba de Amigo has received no other home adaptions, and has never been released in the western world. MiniMoni. Shakatto Tambourine! Dapyon! is compatible with special controllers, provided by Sammy.